At Cabins for YOU, we love our 4-legged friends as much as you do. Forget about boarding and bring your pup along to our pet-friendly cabins in the Great Smoky Mountains! Spend days playing in your own grassy yard, soaking up some sun on a wraparound deck, or cuddled up by the fireplace in your own charming cabin. Browse below or give us a call at 1.800.684.7865 to find the perfect pet-friendly fit for YOU or let us answer any questions you have! 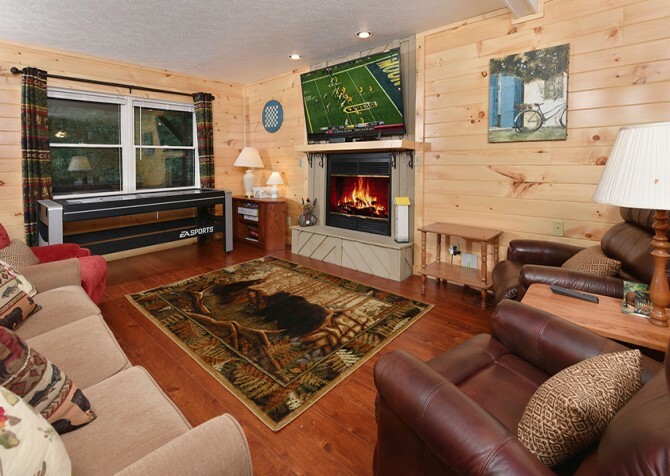 This great group cabin boasts a fire pit with seating, a full kitchen and dining table for 8 (plus outdoor eating areas), a Jukebox, DVD and Blu-ray players, a big screen HDTV, and pool and arcade games for hours of entertainment! It's an awesome all-around space filled with homey conveniences and fun vacation extras! Don’t leave Fido at home this year! 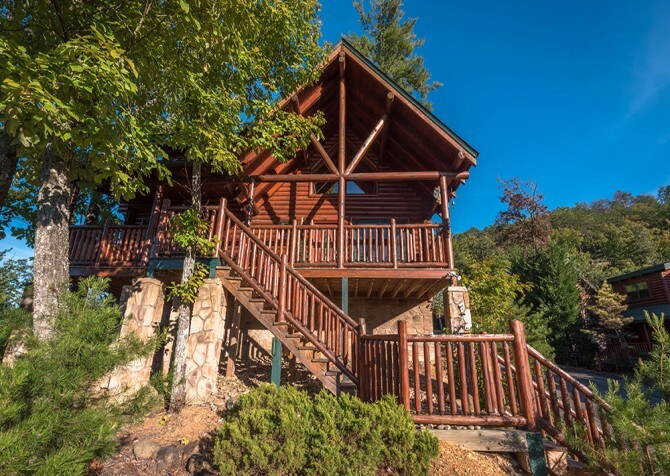 Bring the whole family to the Smokies when you book your stay at As Good As It Gets, a pet-friendly cabin located less than 7 miles from downtown Gatlinburg. 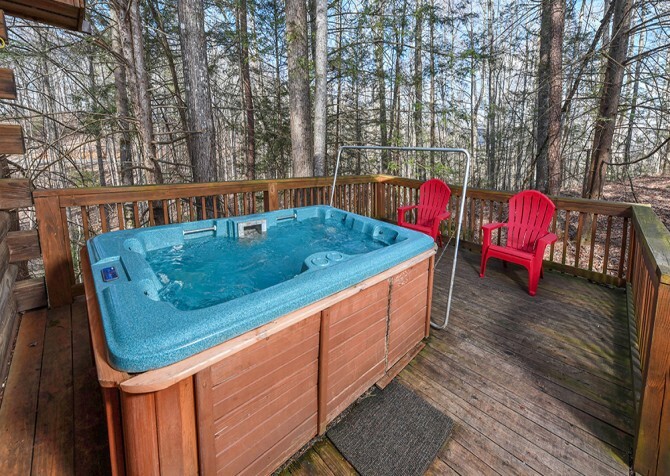 This 2-bedroom cabin features updated living spaces, entertaining extras like a soothing hot tub and fun pool table, and amazing views of the Smoky Mountain trees. 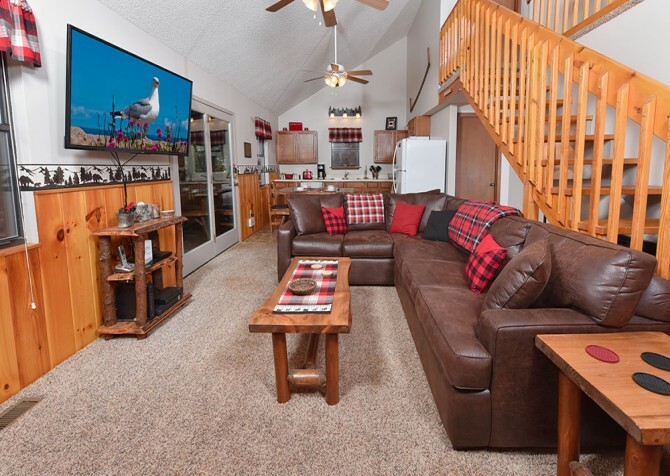 This plush 2-bedroom log cabin features flatscreen TVs, rustic furnishings, and is pet friendly for all members of your family. Enjoy the year-round pool access or head to the game room for a round of pool, darts, or shuffleboard. Stainless-steel appliances in the living area offer an updated feel, while the arcade games and air hockey table offer entertainment. 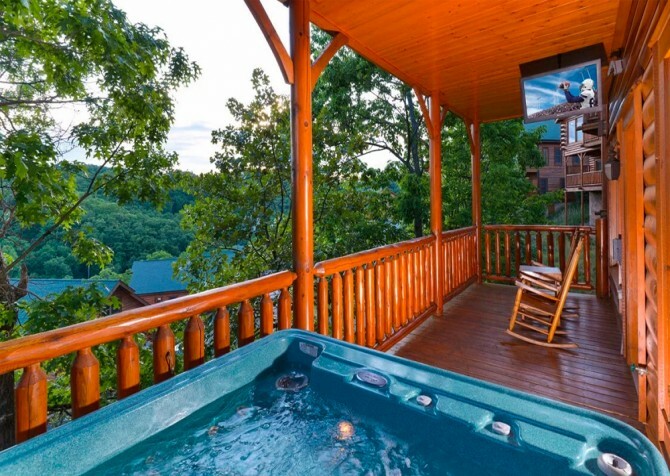 After playing at Dollywood and exploring at The Island, come back to Treasured Times for nights by the outdoor fireplace, soaks in the hot tub on the deck, pool and arcade games, and group meals around the log dining table. Relax and unwind at Good Times - with your pup - while you cozy up on the couch, make meals in the spacious kitchen, sit back in rocking chairs on the covered deck, soak away in the outdoor hot tub, and take advantage of lots of conveniences. At Keaton’s Kottage, large groups are sure to find a variety of ways to relax and have a good time. Let your furry friends curl up on your lap in your private home theater or take a swim with the kids in your indoor private pool. 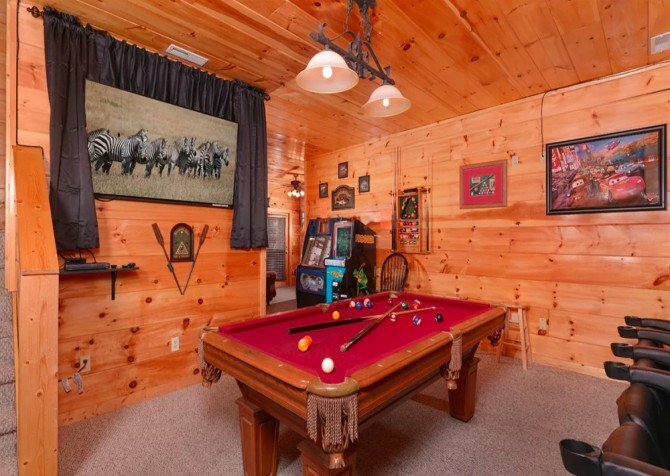 You’ll also enjoy arcade games, outdoor hot tubs, and community pool access at this upscale cabin less than 4 miles from the exciting attractions, restaurants, and shops of downtown. While 2 master suites with gas fireplaces and indoor jetted tubs, a covered deck with a hot tub, pool and air hockey tables, multiple flatscreen TVs, a fully equipped kitchen, spacious living room, and complimentary high-speed Wi-Fi are certainly great for vacations, the best part of A Suite Escape is that it’s pet friendly — meaning your precious pup can come to the Smokies with YOU! 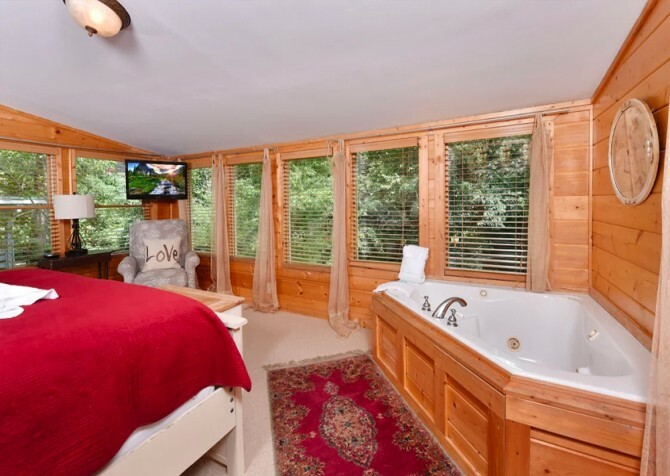 Slip away to this charming 2-bedroom pet-friendly cabin, where you can watch shows on the huge flatscreen TV mounted above the fireplace, cozy up by the fire pit with outdoor seating, soak in the hot tub, and enjoy riverfront views after fun days in nearby downtown Gatlinburg! 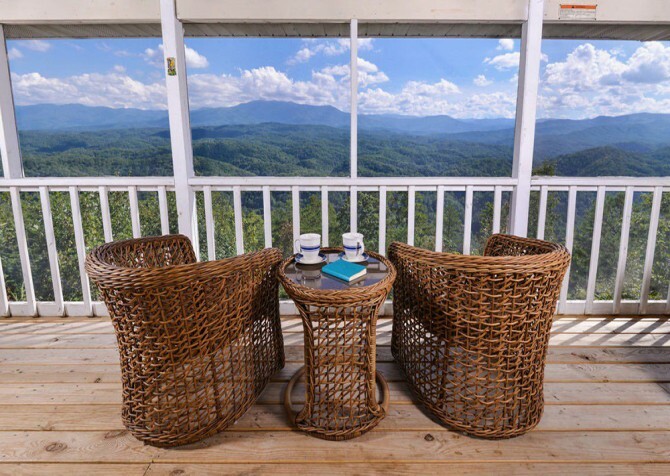 Take in the fresh Smoky Mountain air and Unforgettable views as you relax in a rocking chair at this pet-friendly cabin. The charcoal grill and picnic table allow for summertime memories, while the gas fireplace is perfect for those cool, winter nights! 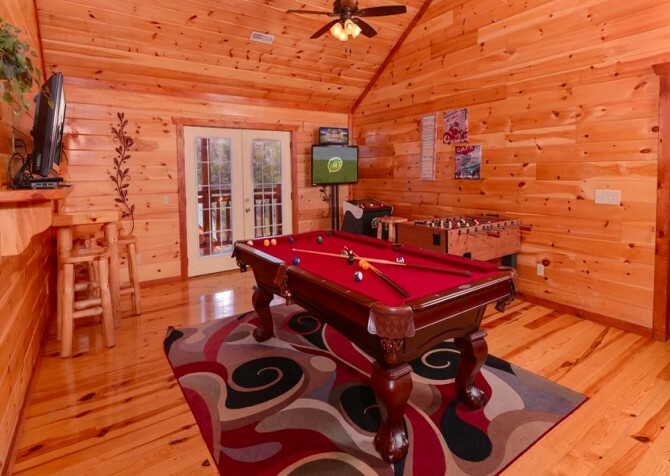 Stay entertained in the cabin with the complimentary high-speed internet, arcade games, pool table, DVD player, and big screen TV. 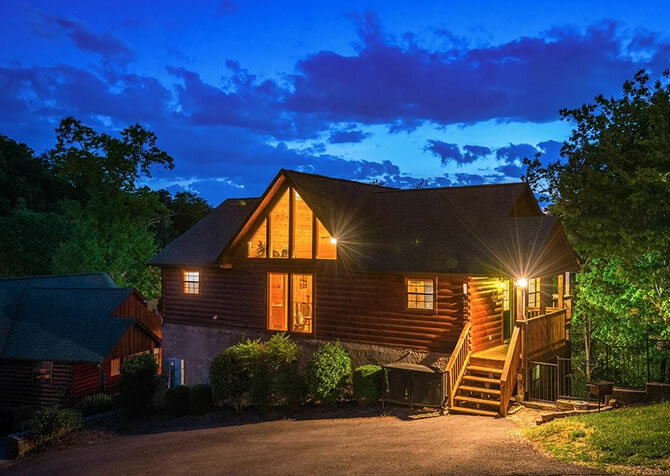 In this charming cabin near Pigeon Forge, enjoy days of soaking in the hot tub, taking luxurious baths in the indoor jetted tub, cozying up in front of the wood-burning fireplace on romantic nights, having candlelit meals in the cabin, or enjoying movie night and relaxing. It’s even pet friendly, so you can cozy up with your 4-legged friend. 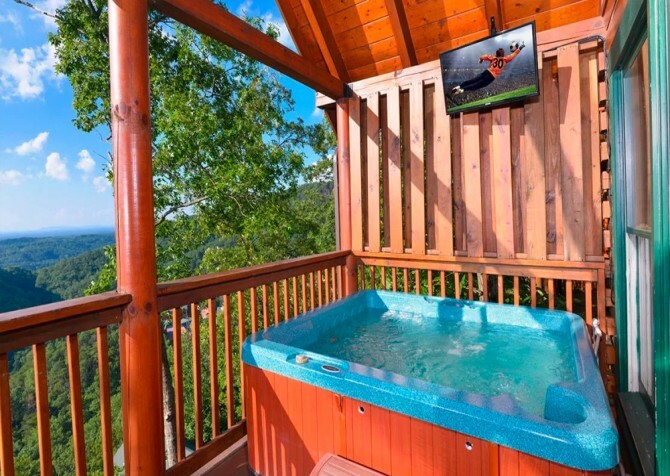 Just minutes from downtown Gatlinburg, Alpine Air is a 3-bedroom, 3.5-bathroom cabin for 8, offering king-size beds, a rec room with a pool table and arcade unit, an outdoor hot tub, indoor jetted tub, and more. Best of all, if you don't want to leave your furry family members behind, don't worry — Alpine Air is pet friendly, letting you bring the whole family along! The list of amenities goes on and on here, with a TV over the hot tub on the deck, a pool table and arcade games, a fully equipped kitchen for making in-cabin meals, a big screen TV and DVD player for movie night, wireless internet, a washer/dryer and charcoal grill, king-size beds for the adults and bunk beds for the kids, TVs in the bedrooms, and so much more! 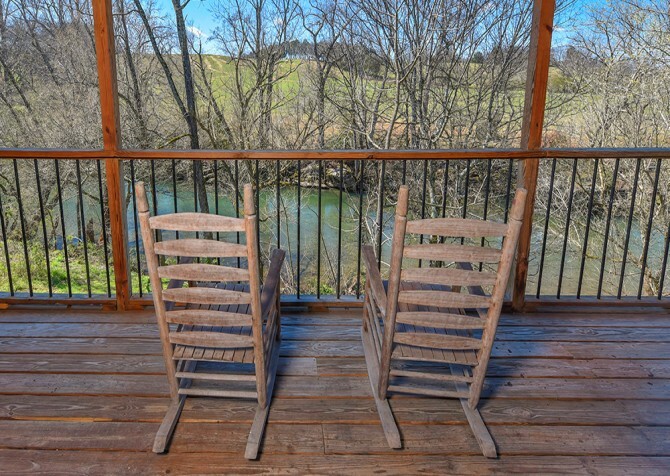 Enjoy the sound of the gently flowing Little Pigeon River from the comfort of your cabin rental: A River Song. 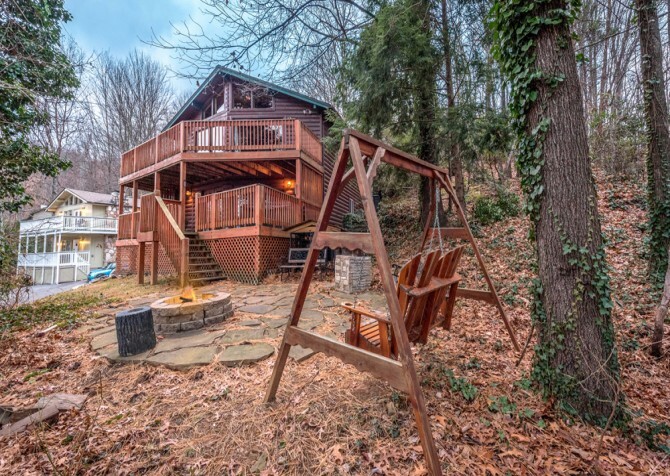 This Gatlinburg cabin features a spacious and private deck with a sitting area and hot tub overlooking the tranquil water — plus homey conveniences throughout. 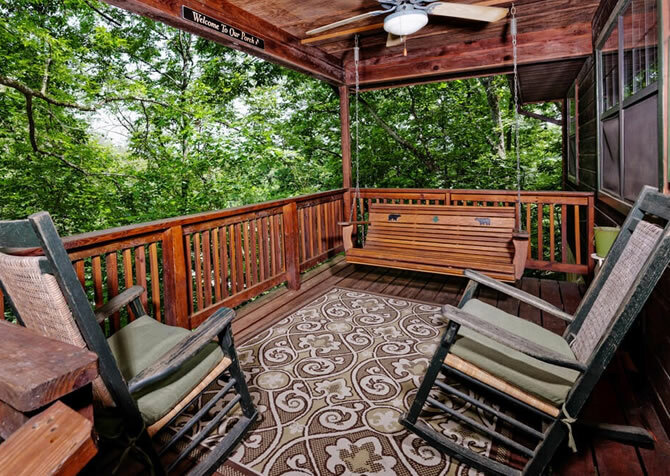 This charming abode is also pet friendly, so the whole family can enjoy a relaxing vacation to the Smokies! This 4-bedroom pet-friendly property is all about luxury, with space for 16 guests, gorgeous views, and amenities like 4 levels of decks, a hot tub, a fireplace, and pool, foosball, air hockey, and poker tables! 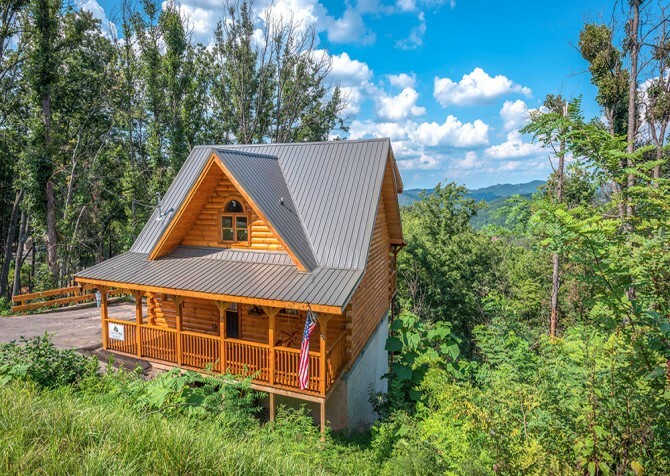 The ideal size for a honeymoon or small family trip, Precious Moments is a studio-style cabin just 10-15 minutes from both Gatlinburg and Pigeon Forge — the perfect location for anyone wanting to check out the area attractions and restaurants. Flat parking makes arriving and unpacking a breeze, and a hot tub with wooded surroundings is a peaceful place to relax. Vintage charm meets a rustic-yet-modern mountain cabin at On River Time. Treat yourself to a cozy king-size bed in the gorgeous master suite with clawfoot tub, fill up the vintage-style refrigerator with snacks to enjoy by the water, and curl up in front of the big screen TV in the living room with your pup at this pet-friendly retreat near downtown! 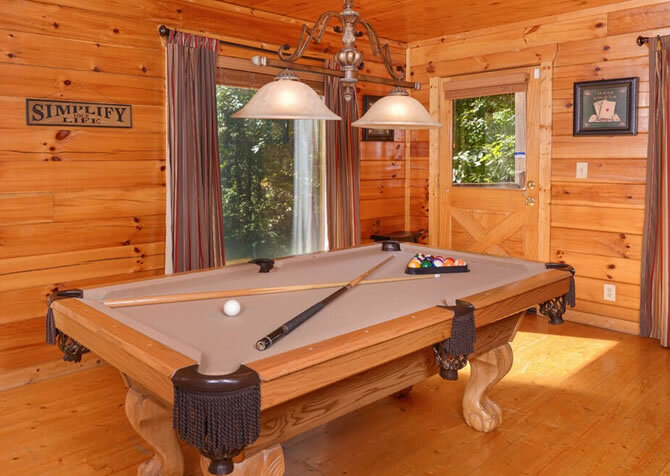 A Smoky Mountain gem, Papa Bear Lodge is great for large groups, featuring 5 bedrooms, 4 bathrooms, a fully loaded rec room, and serene outdoor spaces. 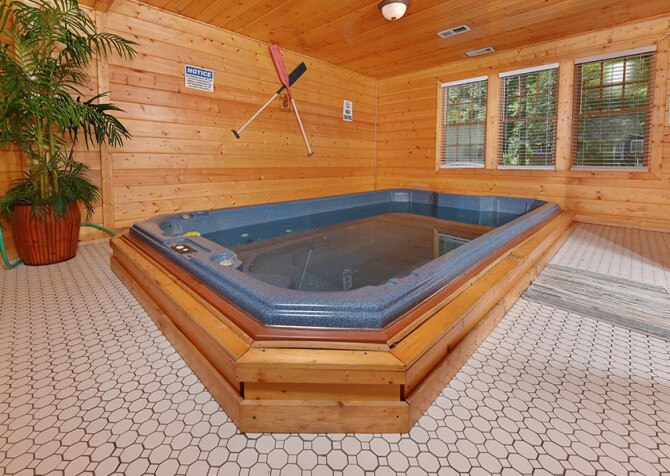 Play air hockey and pool, watch movies on the big screen TV, and soak in the hot tub while watching a show. Plus, you can even bring your beloved pup on vacation as this home is pet-friendly! 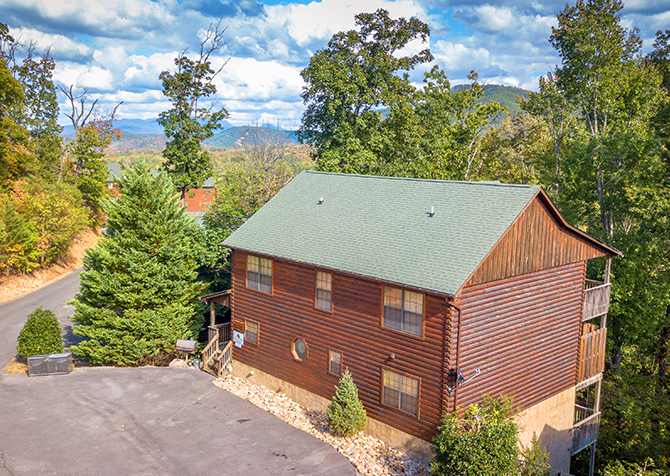 Bring the whole family, including the pup, to escape to the peaceful beauty of the Smoky Mountains in this charming 2-bedroom +loft cabin for 6 only a short drive from the daily excitement of downtown Pigeon Forge. 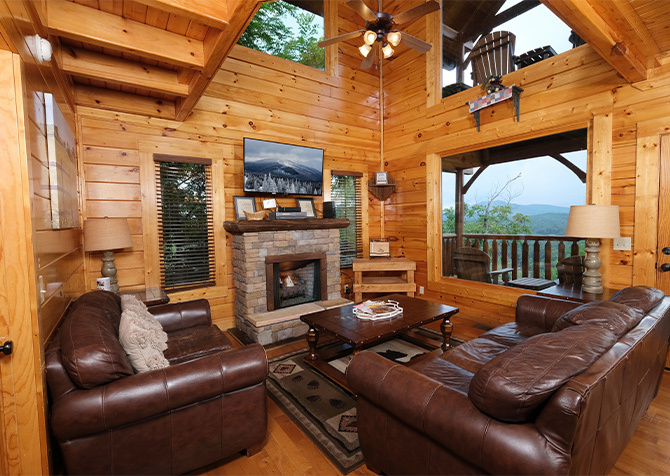 Cozy and luxurious, this two bedroom Pigeon Forge cabin rental is only a short drive from the downtown area. Access the indoor and outdoor pools on your Smoky Mountain vacation. Multiple game tables offer you a means of entertainment, while the spacious covered deck gives you a serene place to kick back and relax. 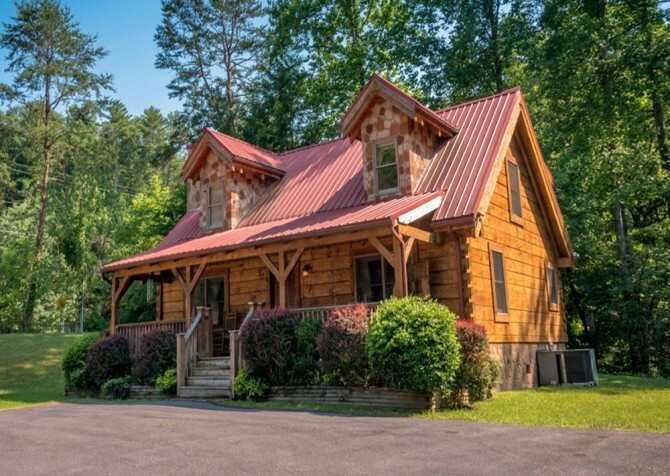 With space for a group, this beautiful Pigeon Forge cabin offers games and amenities inside, an awesome yard outside, and tranquil spaces throughout. After exploring downtown, come back to play in the grass with your pup, soak in the outdoor hot tub while others grill up a feast, play board games in the rec room, curl up by a toasty fire, or end the night in a comfy king-size bed. 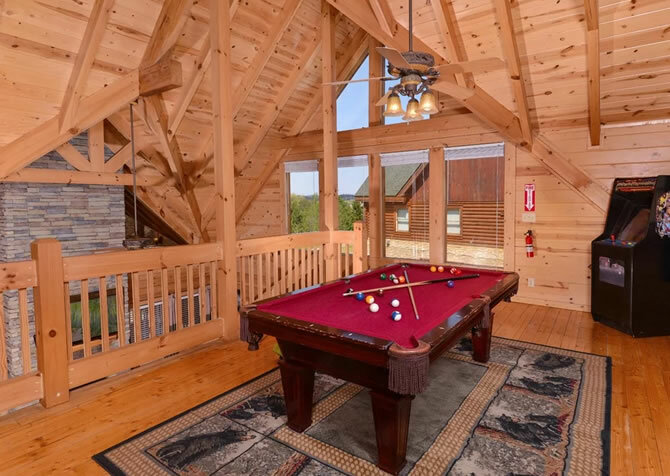 A pet-friendly cabin with the amenities and size for a family vacation, Oh Yea boasts high-speed internet, a big screen TV and DVD player, game tables, and a hot tub. Enjoy access to an indoor and outdoor pool and a close location to area attractions and restaurants quickly and easily. 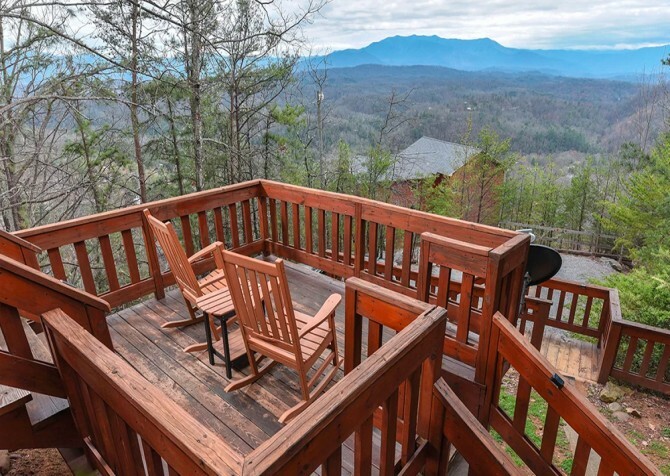 Gorgeous Smoky Mountain views complete this great getaway. 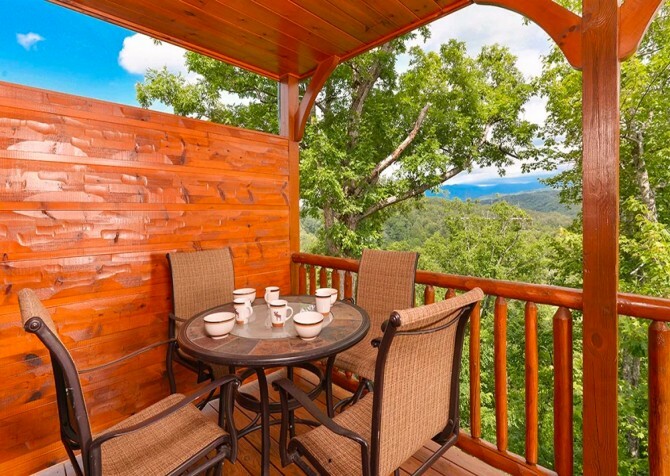 Enjoy the serenity of the Smokies and soak in your beautiful valley view when you vacation to this 1-bedroom cabin rental in scenic Pigeon Forge. 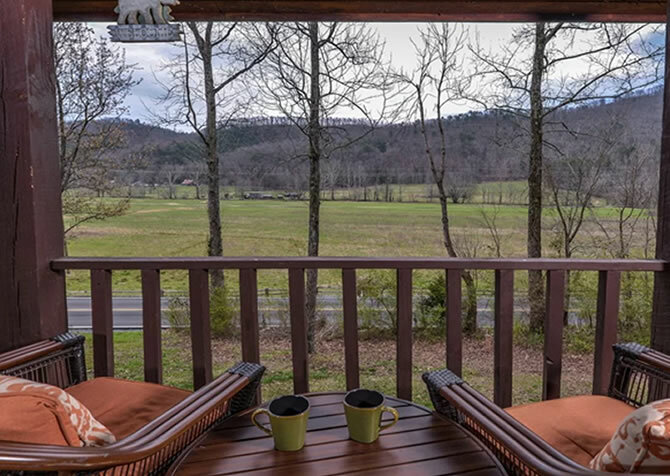 Bring along your furry family members to this pet-friendly cabin, prepare meals in your fully equipped kitchen, relax on the porch swing, play pool, and take advantage of the washer/dryer to feel right at home in this Pigeon Forge cabin. 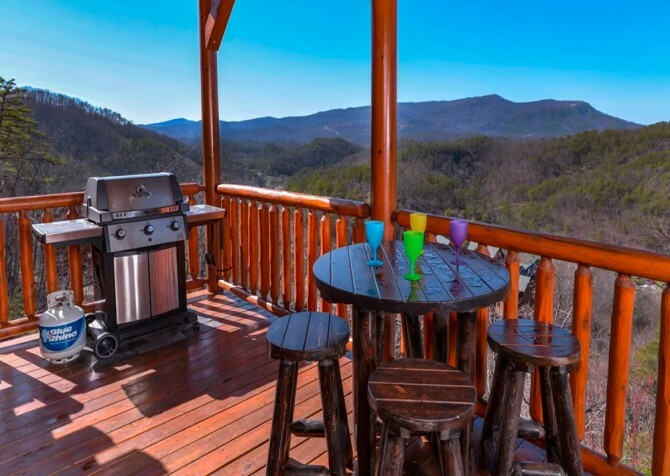 This impressive 2-bedroom Pigeon Forge cabin accommodates up to 6 guests along with your favorite furry friend so you can bring the whole family to enjoy soul-stirring mountain views from the back deck. 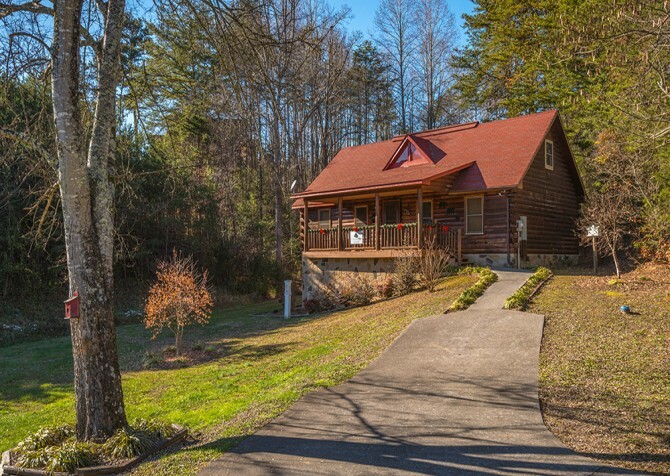 Enjoy a convenient location near downtown, along with mountain and wooded views, at this beautiful 2-bedroom pet-friendly cabin in Pigeon Forge. Dancing With the Stars is fun and relaxing, with a heart-shaped jetted tub, Wi-Fi, a TV above the hot tub, and lots of games – air hockey, pool, and an arcade! It's enough to keep everyone entertained! Bring your furry friend along for a memorable cabin stay at Gigi’s Getaway — a 3-bedroom, 3 1/2-bathroom, pet-friendly cabin in Gatlinburg, TN! 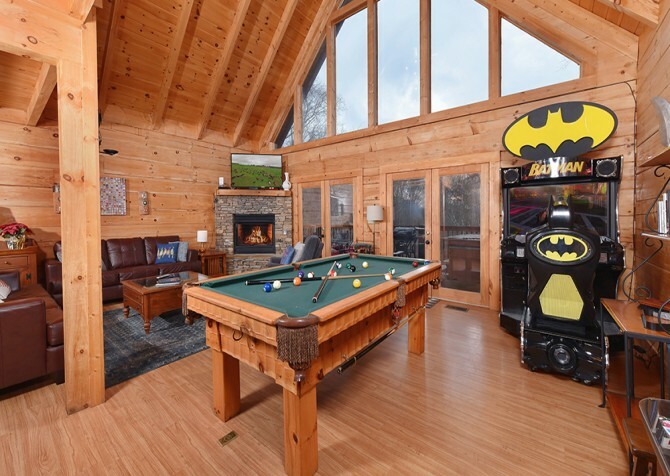 Soak in the bubbly hot tub, play pool and arcade games, whip up meals in the fully equipped kitchen, sip morning coffee with tranquil wooded views, and head to dreamland with a comfy mix of king, queen, and bunk beds. Bring your furry friend on your next Smoky Mountain vacation to Keaton’s Cozy Cabin in Pigeon Forge. Rough house together on the large area rugs throughout the home, play tug of war with his favorite toy in the media room, lay his jumbo bed by your king-size one at night, and cozy up by the warm fire together on cooler nights. 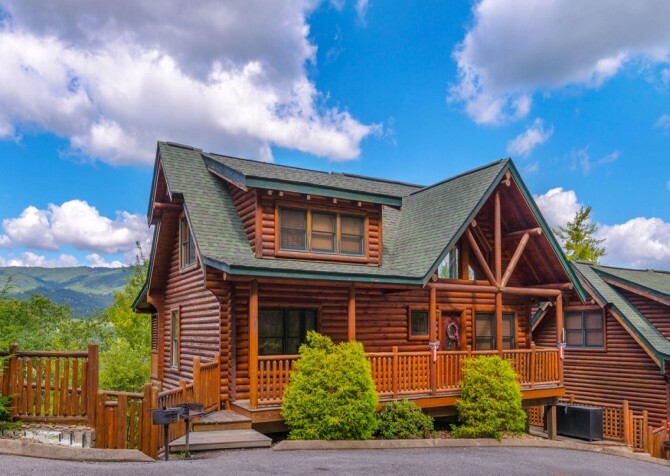 This year, the whole family can enjoy the rest and rejuvenating effects of a cabin trip to the Smoky Mountains in this pet-friendly cabin a short drive to downtown Pigeon Forge! 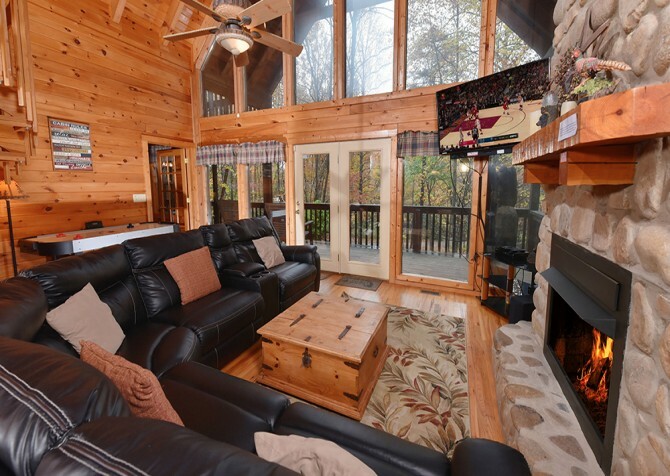 Pet friendly and boasting space for a large group, this 4-bedroom Pigeon Forge cabin is loaded with amenities. 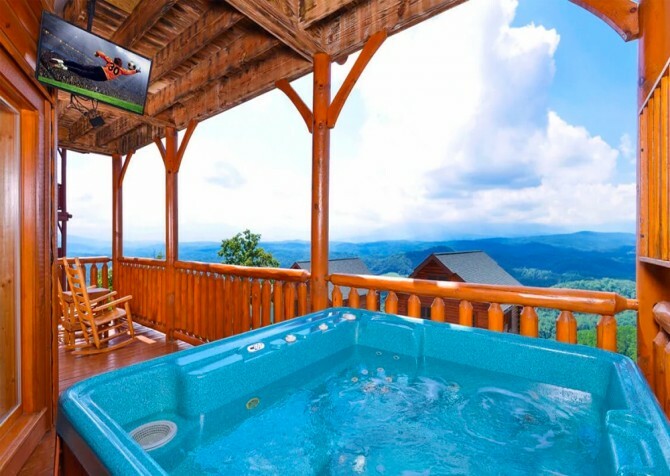 Soak in the hot tub while watching TV; play pool, air hockey, and arcade games; enjoy the incredible Smoky Mountain views from the rocking chairs on the 2 decks; or explore the shops and attractions just a few miles away. This pet-friendly Gatlinburg getaway is minutes from downtown and boasts relaxing spaces and convenient amenities. Enjoy your own swim spa, big screen TV, wireless internet, and a fully equipped kitchen in this inviting and charming 2-bedroom, 2-bathroom cottage with a loft! 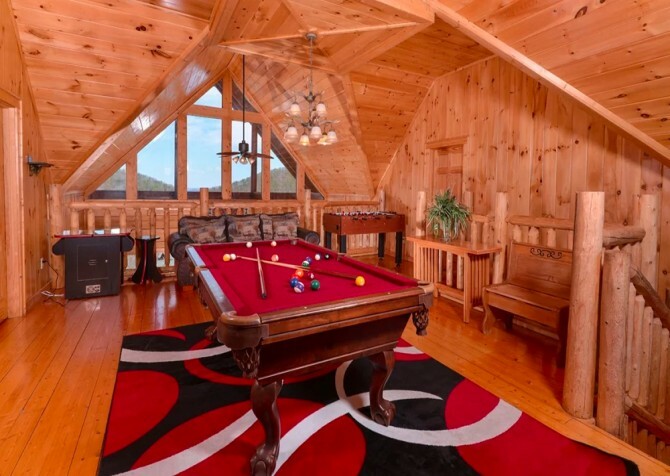 Spend days splashing in your private indoor pool, making group meals in your fully equipped kitchen, playing arcade games with family and friends, and relaxing with your pup at this 3-bedroom cabin in Pigeon Forge! With space for 12, it’s fit for fun family vacations, weekends with friends, and couples’ retreats for romance and relaxation. Located in the Legacy Mountain Resort, Legacy Mountain Magic offers tree-studded views and easy access to area attractions. Explore downtown before coming back to relax in the rocking chairs on the deck, soak in the hot tub, make meals in your fully equipped kitchen, watch movies on the 65-inch smart TV in the theater room, or cozy up in the living room. It's comfort and convenience all around! This cabin was made for fun – even the 4-legged kind – inside and out. Enjoy a relaxing fire pit and grassy areas outside, cozy spaces and conveniences inside, and that classic mountain feel throughout. 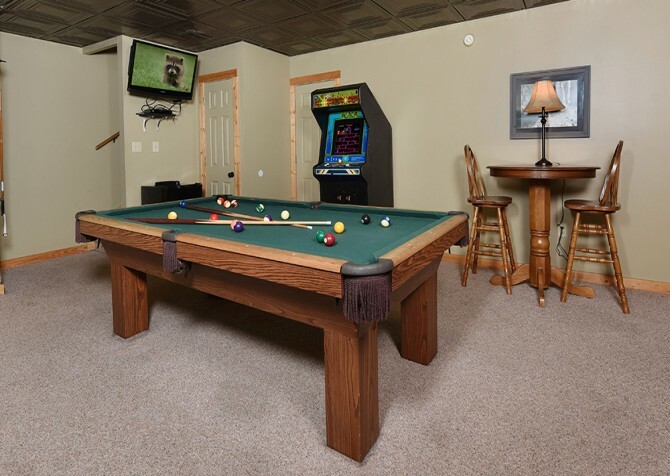 You can play corn hole, soak in the jetted tubs, lounge and watch Netflix, or play pool, air hockey, and foosball! The possibilities for fun are endless! Get away with your group to the pet-friendly Black Bear Lodge, where space for 23 and luxurious updates await. 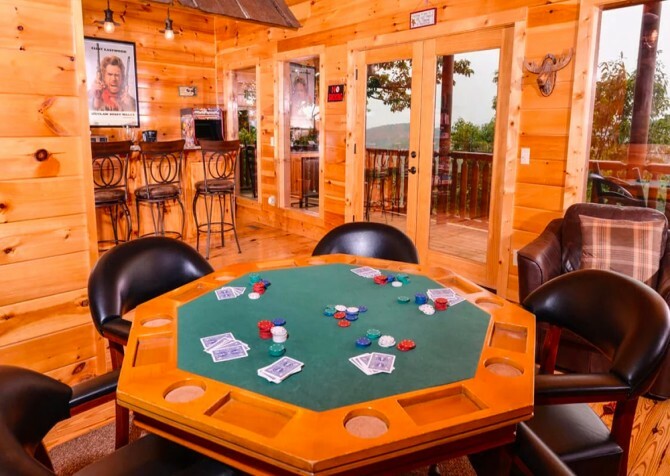 Play around with game tables, end your evenings with soaks in the outdoor hot tub, sit back in the rocking chairs overlooking the mountains, and have movie night in your theater room/living room! 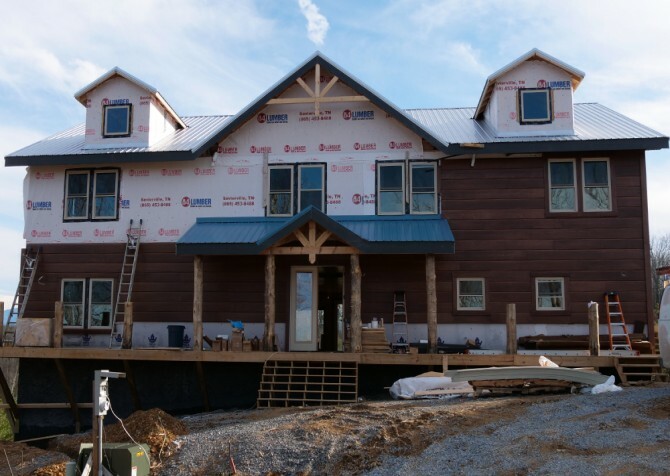 A pet-friendly Pigeon Forge cabin, Moondance offers space for family and furry friends. Mountain views are framed by windows throughout the cabin, and outdoor spaces boast a hot tub, grill, and plenty of seating. 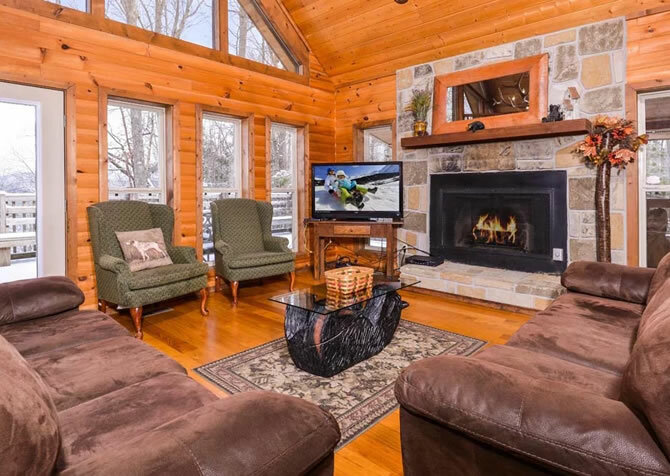 Inside, cozy up in front of the fireplace with a book, flip on the big screen TV (with DVD player) for movie night, or play pool and foosball for a fun night at the cabin! Bring your fur baby to A Mountain Surprise for a relaxing vacation in Pigeon Forge — you (and your pup) deserve it! Play fetch in the yard, relax on the porch swing, grill burgers on the gas grill, bake tasty treats in the fully equipped kitchen, and cuddle up for movie night on the big screen TV! Without a doubt, this vacation home will make your pooch feel right at home. 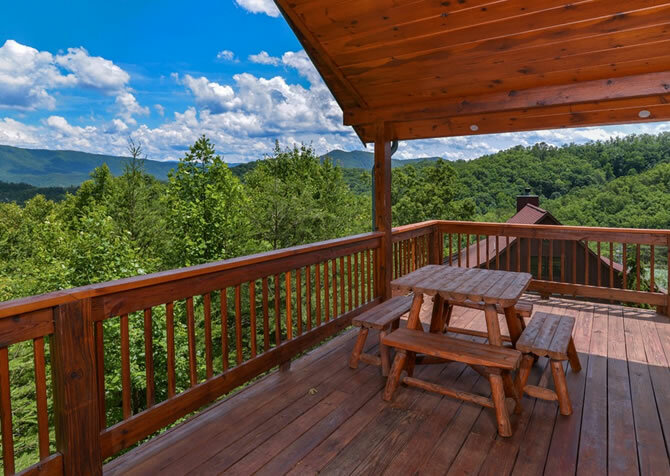 Spend your next vacation in a secluded, pet-friendly cabin in the Smokies! Bring the whole family — including the dog — for fun barbecues with the gas grill, board game night in the family room, cozy nights by the gas fireplace, and movie night in the media room. Don’t forget to bring Fido a treat home when you return from your day on the town in Pigeon Forge! A pet-friendly cabin, Sleepy Hollow will gladly watch over your little pup while you spend the night on the town, give him a comfy nap zone in the living room, show him interesting sights from the windows, keep him entertained with the big screen TV, and provide a quaint snacking spot in the fully equipped kitchen. And you'll have a comfy place to call home after you've spent the day exploring! Great for fun family getaways and weekends with friends, the 3-bedroom Mountain Getaway and a Theater features plenty of entertainment. After exploring nearby downtown, come back to play arcade games, pool, air hockey, and foosball. It's also pet friendly has lots of conveniences like a fully equipped kitchen and high-speed Wi-Fi! 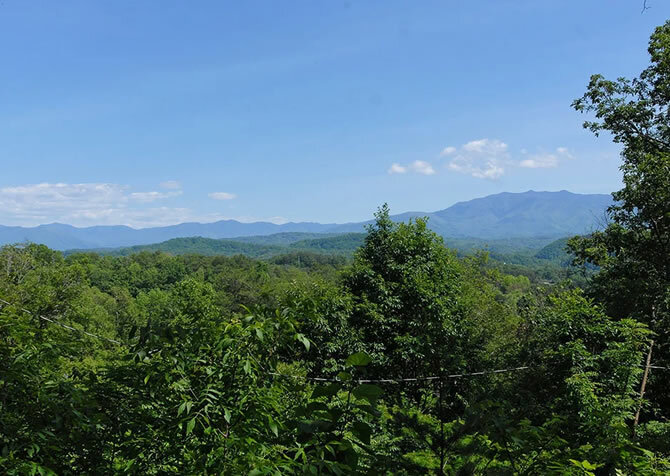 A charming mountain retreat, Lorin Aleah is a 2-bedroom, 1-bathroom Pigeon Forge cabin is wonderful for a family vacation. 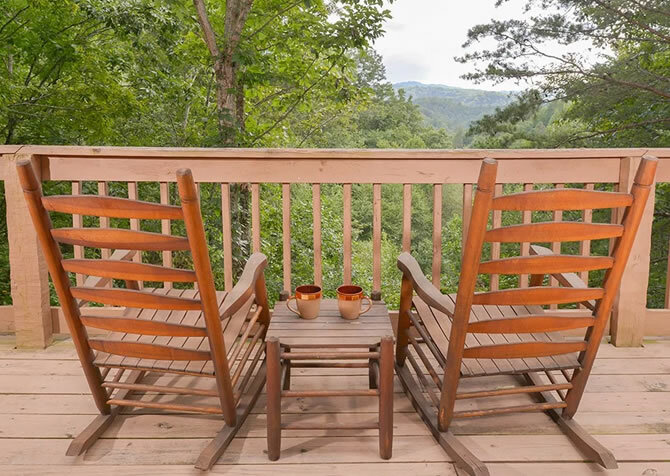 Less than 3 miles from downtown, this pet-friendly cabin offers a large hot tub, covered deck with rocking chairs, and a semi-private, quiet location for peaceful nights. Enjoy the satellite television, prepare a meal in the full kitchen, or just lounge in the living area. 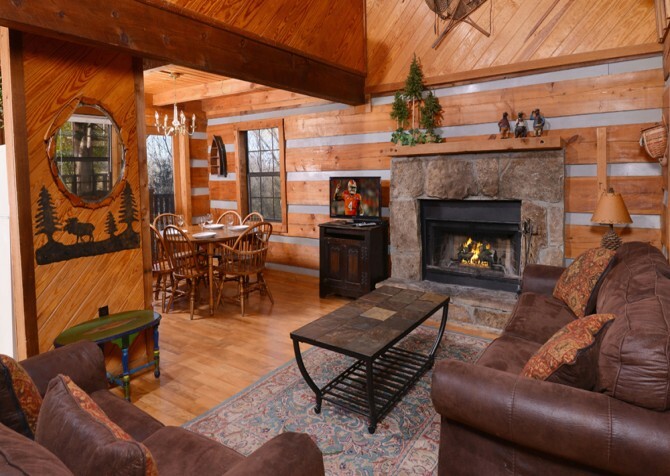 A cozy cabin near downtown Pigeon Forge, Casa di Amore is perfect for family vacations and getaways with friends. It's pet friendly and features game tables in the rec room and a relaxing outdoor hot tub where you can soak tired muscles after a busy day in town. Plus, the impressive master suite is its own retreat, with a fireplace, king-size bed, and soothing jetted tub! A pet-friendly getaway with plenty of space, Unforgettable Views and a Theater boasts room for 10, game tables in the fun rec room, a big screen TV, and a romantic heart-shaped jetted tub! 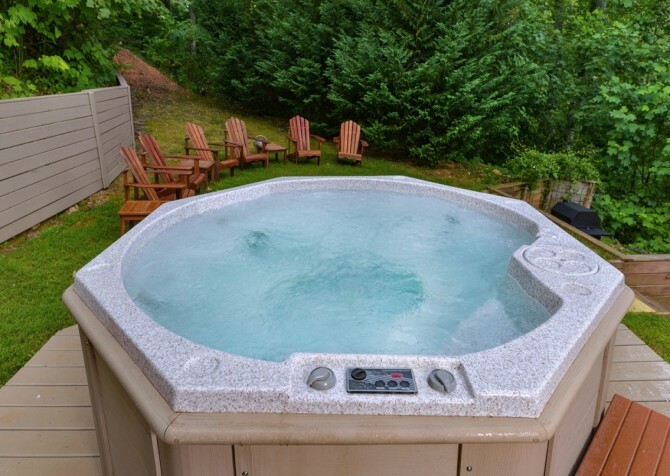 At night, climb into a king-size bed or the soothing outdoor hot tub. Bring your favorite furry family member with you for a quiet escape in the Smoky Mountains near the lovely city of Sevierville in this charming pet-friendly, 1-bedroom, single-level cabin with fun décor, community pool access, California king-size bed, foosball table, dart board, fully loaded kitchen, and enough space to sleep 6 guests for a romantic escape, small family vacation, or anniversary trip. 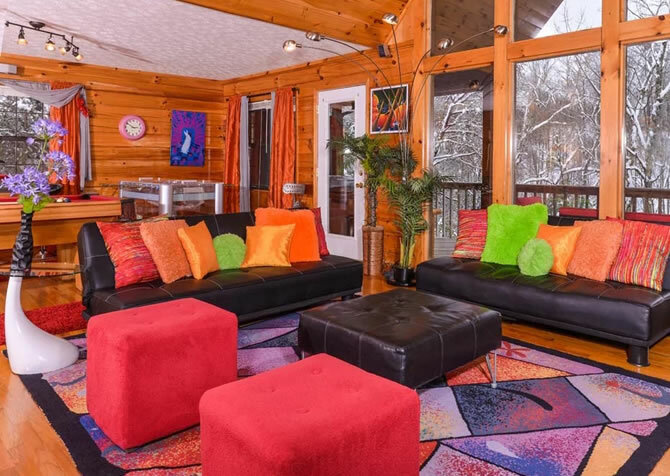 Lots of comfortable seating, a secluded lot, and room to sleep up to 16 guests makes this 5-bedroom (+loft), 3-bathroom Gatlinburg cabin perfect for family vacations and small group getaways. A location near the Great Smoky Arts & Crafts Community allows guests to see local artisans at work. Powdermill Lodge is also pet friendly, so guests can bring their 4-legged friends along! Make your vacation even more memorable by bringing along your 4-legged friend for your upcoming Smoky Mountain trip. 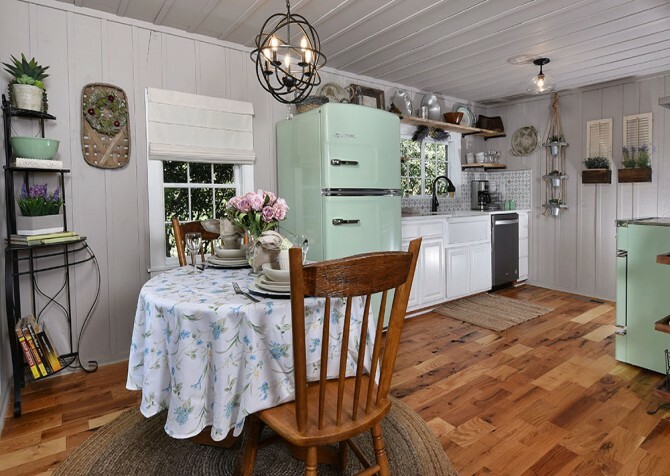 Red Bud Cottage is a 2-bedroom, one-level, pet-friendly abode with a spacious front yard for catch, a fully equipped kitchen for midnight treats, a charcoal grill for barbecue drippings, a cozy reading nook for at-your-feet naps, and charming wooded views to watch the squirrels play. 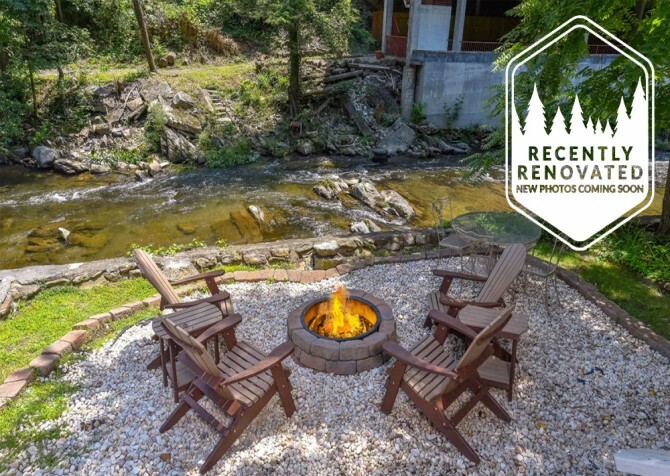 A pet-friendly riverfront property with a luxurious kitchen and relaxing hot tub, River Retreat provides a comfortable, inviting place for a family vacation. Relax on the spacious deck and look out at the Little Pigeon River, play pool or foosball, or watch TV in bed at the end of the day. 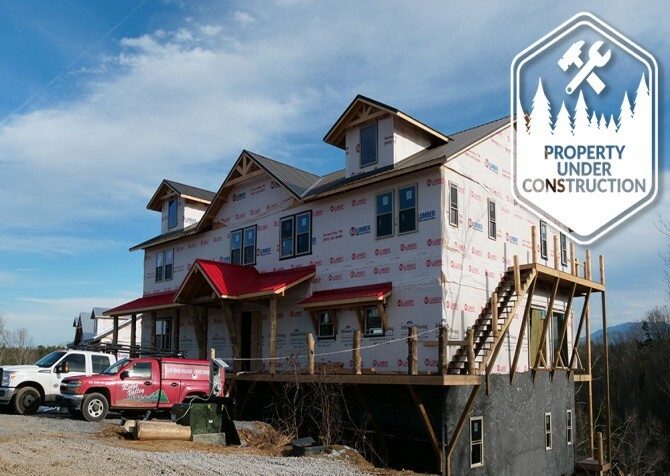 This Pigeon Forge cabin on the water will offer an escape from the everyday hustle and bustle. 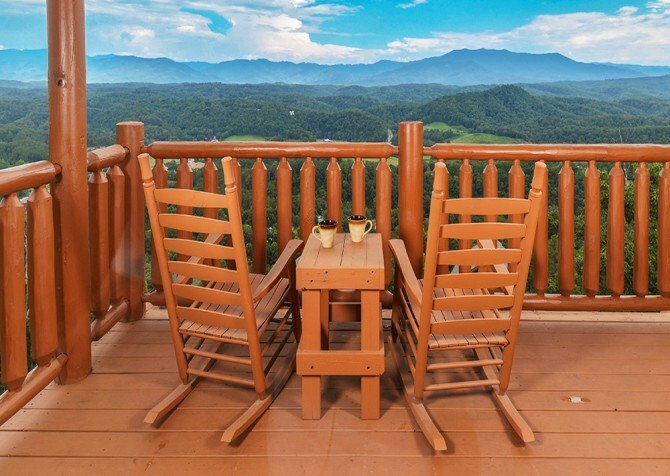 A pet-friendly cabin in Pigeon Forge, A Point of View lets you bring the whole family along for fun and relaxing vacations in the mountains. Swim in your private indoor pool with water features and stone surround, soak up mountain views, and feel at home with a long list of conveniences. Bring along your 4-legged friend for a pet-friendly vacation in the Smokies at Endless Views and a Theater! 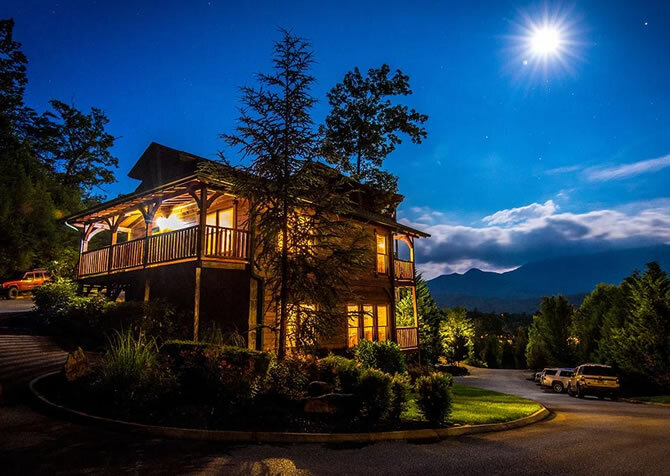 Have movie nights in your own theater room, lose yourself in Smoky Mountain views, play games in the fun rec room, or head to downtown Gatlinburg - just 2 miles away! Don’t leave your furry best friend behind when you visit Pigeon Forge this year. Traveler’s Rest is a 3-bedroom, 3-bathroom cabin with room for 8, and your precious pets are more than welcome to tag along! 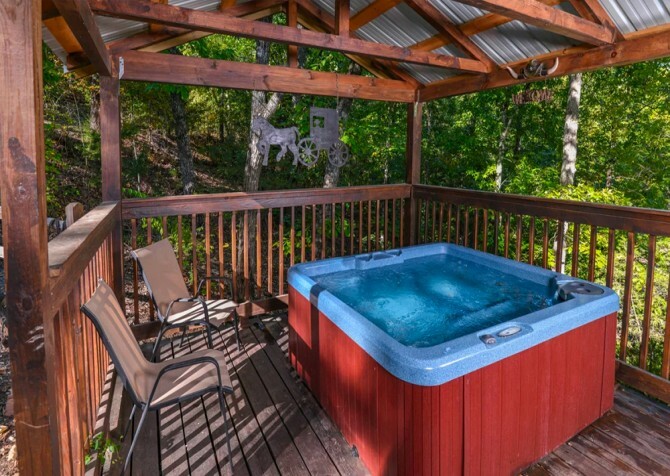 Enjoy a large rec room, multiple levels of decks, an outdoor hot tub, convenient high-speed internet, and 2 indoor jetted tubs at this semi-private cabin less than 3 miles from downtown. 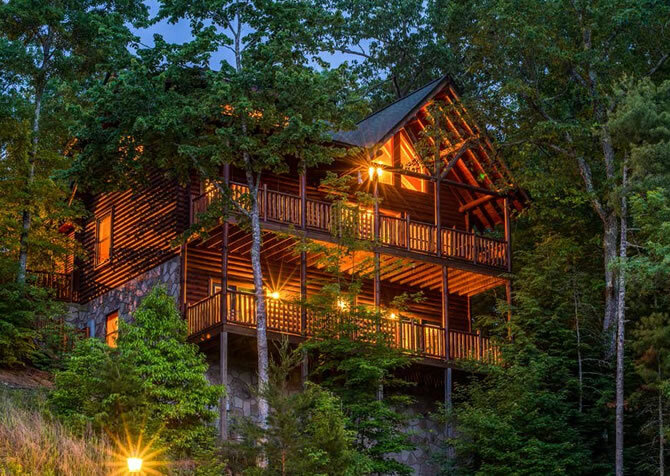 This Smoky Mountain cabin is a great vacation rental for your family — including your pet! Imagine your pup’s face as he tilts his head back and forth to the mysterious tune of the wind chimes on the back deck, his sleepy sigh as he finishes making his nest on a cozy rug, or his wagging tail as you give him a treat from town. You can soak in the hot tub, sip coffee on the deck, and feel right at home. Invite the entire family — furry members, too! 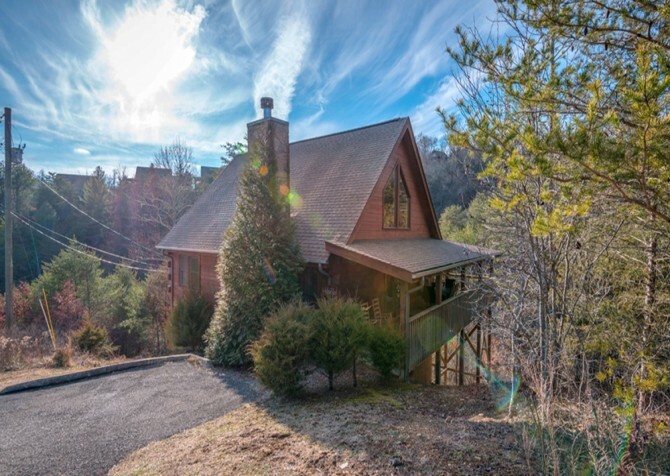 — on your Gatlinburg vacation this year when you stay at A Wildflower Retreat. This pet-friendly cabin features sleeping space for 8, a front porch plus a back deck, an outdoor hot tub, an indoor fireplace, a pool table, 55-inch big screen TVs, a charcoal grill, a fully equipped kitchen, and so much more. 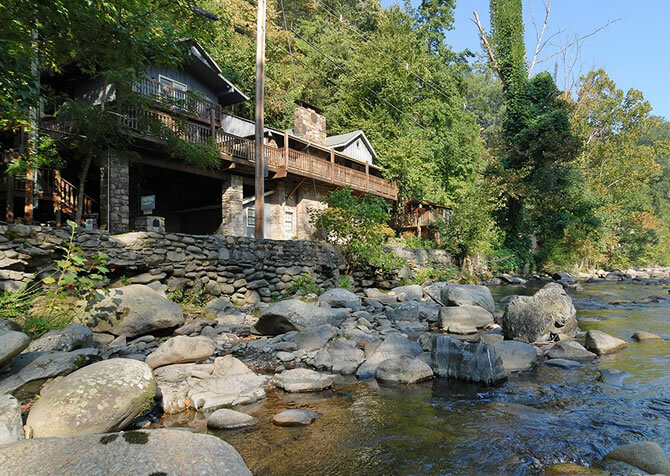 Nestled along the Little Pigeon River, On the River is a 1-bedroom, 1-bathroom cabin less than 1 mile from Gatlinburg. Offering a convenient location, tranquil riverfront vibes, and room for 2, this quaint home features an outdoor hot tub, king-size bed, big screen TV, complimentary Wi-Fi, and more. It’s even pet-friendly — arguably the best perk at On the River! 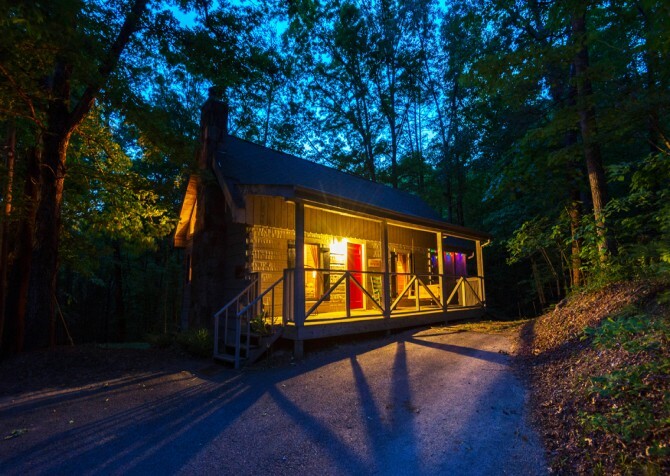 Tail wags abound at The Tree House, a pet-friendly, 1-bedroom, 1.5-bathroom cabin for 4 in Gatlinburg, TN! Play with your pup’s favorite toy in the living room, watch a movie marathon on the big screen TV, whip up tasty treats in the fully equipped kitchen, enjoy soothing soaks in the outdoor hot tub, and snuggle with your spouse in the king-size bed. 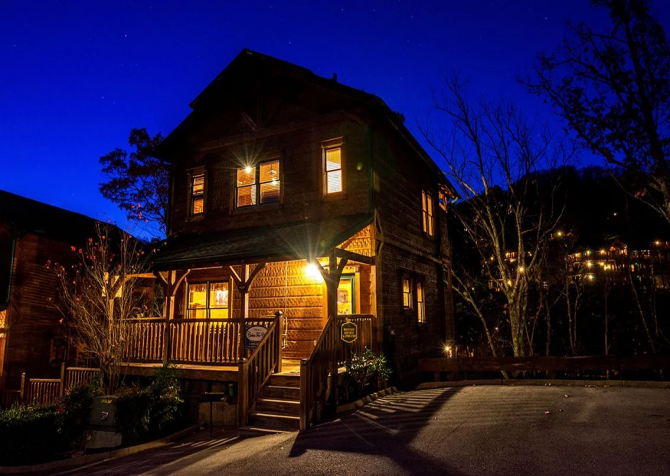 A pet-friendly cabin near downtown Gatlinburg and the Great Smoky Mountains National Park, Bearfoot Lodge is great for families and groups. It offers king-size beds, bathrooms easily accessible through each bedroom, surround sound, HDTV, high speed wireless, a wet bar, game tables, fireplaces, and a fully-equipped kitchen. It also has a fantastic outdoor area with a fire pit and seating! Bring your pet along for your next family vacation at Bear Crossing, a pet-friendly cabin in the Smokies! Complete with a gas fireplace, 2 indoor jetted tubs, porch swing, rocking chairs, and an outdoor hot tub, this home away from home has it all. Play fetch with your pooch in the spacious front yard while others grill burgers in the back yard. 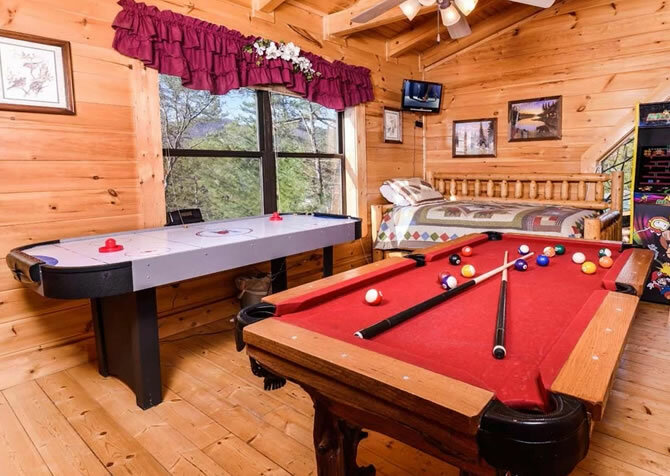 Featuring lovely wooded views, a bubbly hot tub, game tables (including air hockey, pool, and foosball) in the rec space, and flatscreen TVs, Big Bear Retreat is certainly entertaining. 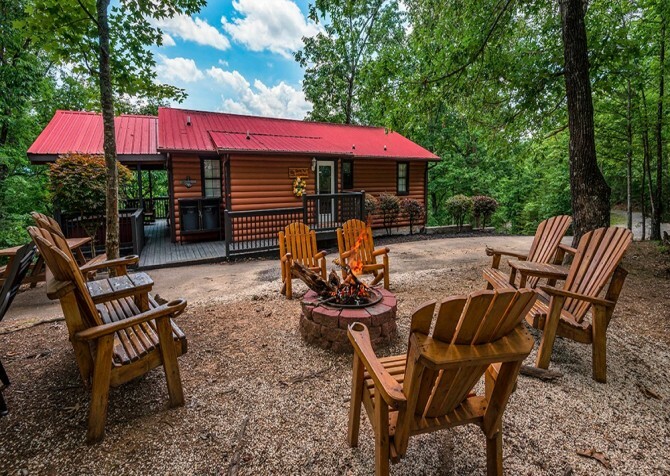 This 3-bedroom, 3-bathroom cabin for 10 in Pigeon Forge is also pet friendly, so you can bring all your family members — Fido included! 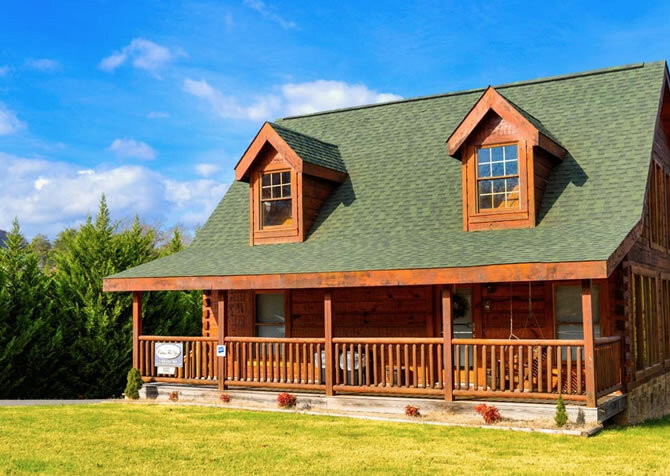 Less than 10 miles from downtown Pigeon Forge, The View is a 2-bedroom, 2-bathroom pet-friendly cabin with room for 10 and tons of amenities. 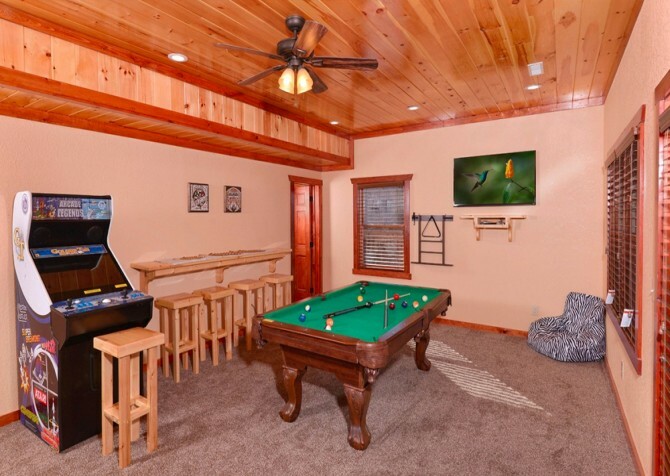 Spend hours playing pool, air hockey, and arcade games or watching movies on the huge TV in the rec room. 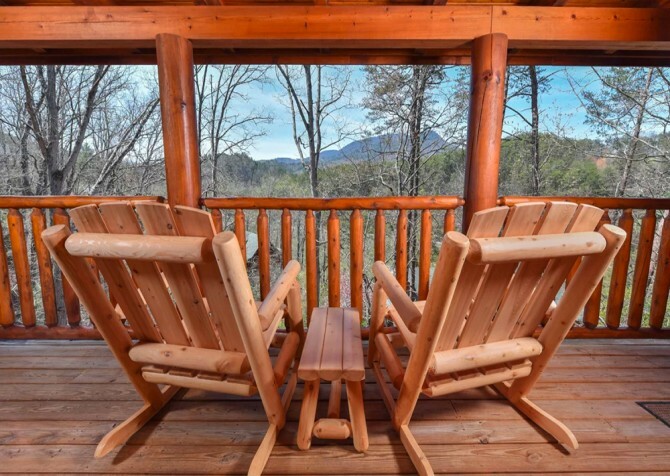 After, relax on the leather sofas in the living room, unwind in the hot tub as you watch TV on the deck, or just take in the mountain views from the rocking chairs. 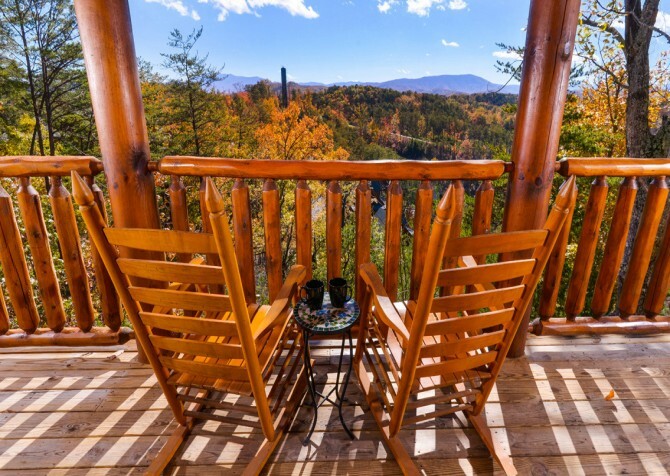 A pet-friendly cabin located in the Preserve Resort, Over The Top offers gorgeous mountain views from the covered hot tub or rocking chairs on the deck. Inside, amenities such as high-speed Wi-Fi, a foosball table, pool table, and big screen TV are fun and convenient. The full kitchen is beautiful and spacious, and the living area with plush couches offers more wonderful views. Want to bring Fido along for your Smoky Mountain retreat? SlumberJack understands! 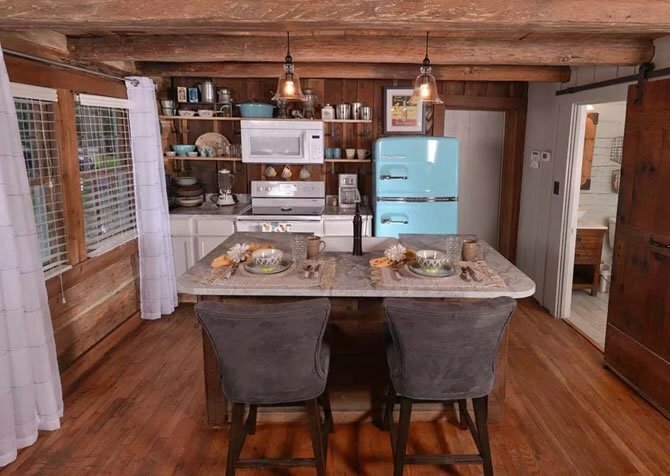 This pet-friendly cabin with 2 bedrooms, 2 bathrooms, and a fully equipped kitchen offers space for 7 guests, perfect for family vacations or getaways with friends and your furry friend. Play foosball together, watch movies on the big flatscreen TV, chat by the wood-burning fireplace, and soak in the enchanting woodsy views. 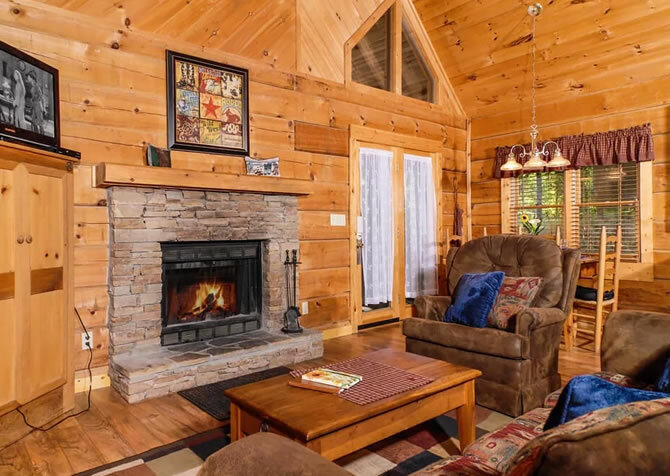 Located in Covered Bridge Resort, Bearly Normal is a pet-friendly, 3-bedroom, 2-bathroom cabin for 10 in Pigeon Forge. Offering community pool access, an outdoor hot tub, lovely mountain views, rocking chairs, flatscreen TVs in all bedrooms, and an original Xbox, friends and family — including your pet — will enjoy a memorable stay indeed. 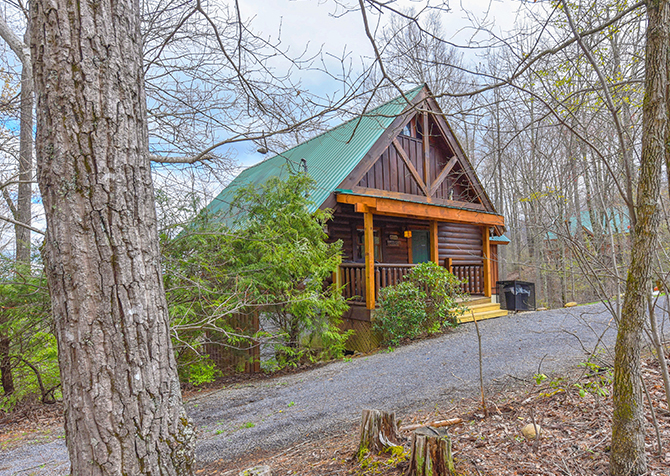 Only minutes from downtown Pigeon Forge, this 2-bedroom cabin rental features a semi-private location that you will love. 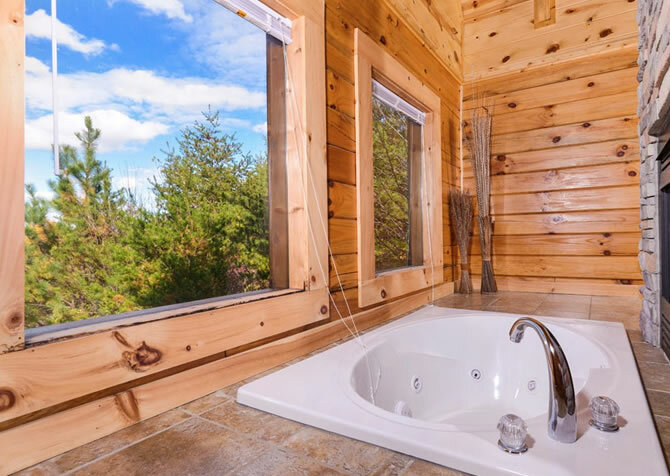 All members of your family are invited to this pet-friendly cabin, which offers 2 indoor jetted tubs and internet access to keep you connected while you're away. After an exciting day downtown, build a fire and settle in for a cozy night in your cabin rental. Between the community amenities and the perks inside the cabin, American Pride is a great all-around cabin for family getaways and weekends with friends. You can swim in the community pool, enjoy picnic lunches on the deck – with awesome mountain views – play pool, soak in the hot tub, or head to the catch-and-release pond for a peaceful afternoon. 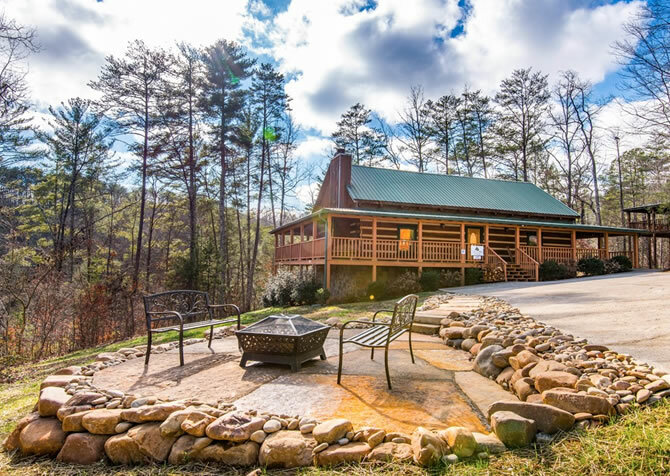 Slip away for fun with family and friends at this 3,600-square-foot cabin that's pet friendly and just a few miles from downtown! 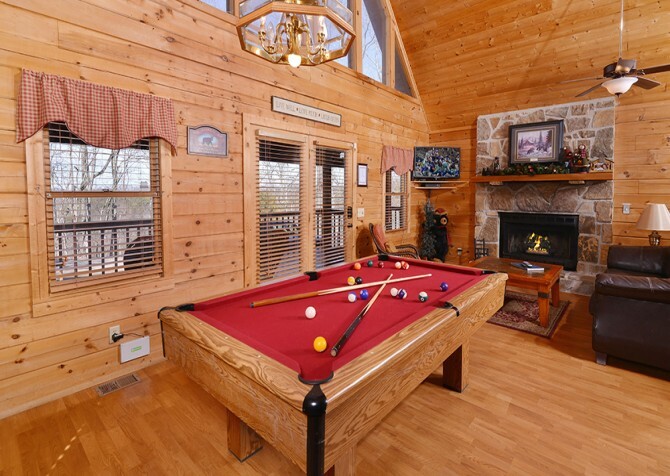 Splash in the pool, soak in mountain views, and have fun in the cabin with plenty of game tables and arcade games! 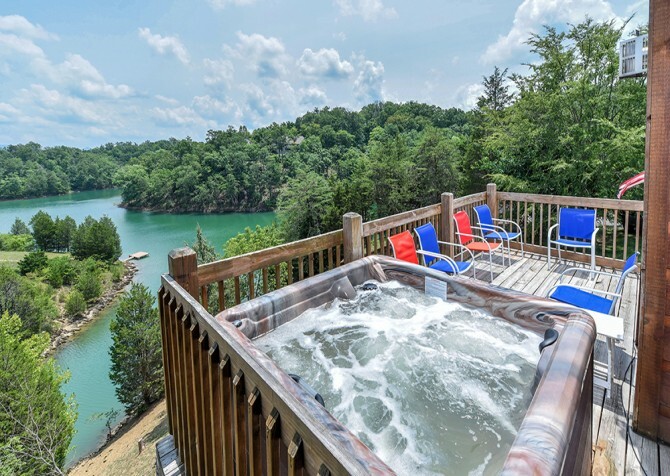 From easy lake access to a lake house packed with fun and comfort, a Smoky Mountain getaway at Lakeside Mountain Memories is one you won’t forget! Plus, this cabin home is pet friendly, so you can bring your precious pup along, too. 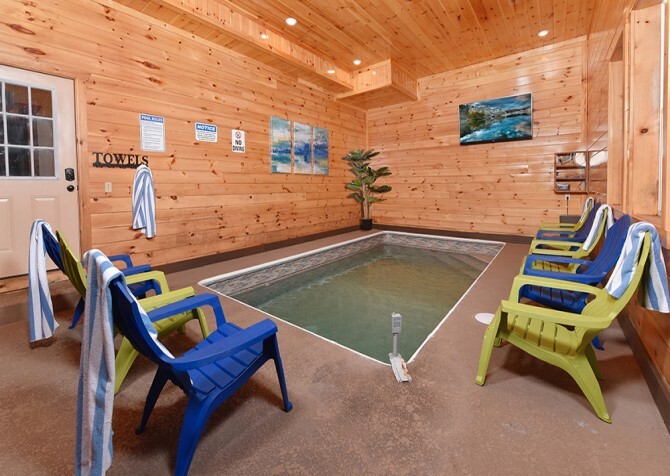 Enjoy beautiful sunrises over the mountains, movie night on the big screen TV, relaxing soaks in the hot tub, and game tournaments in the rec room. With 3 cozy bedrooms (each with their own premium smart TV), 2 full bathrooms, a fully equipped kitchen, and a charming living room with a wall-mounted TV, game table, and a gas fireplace, Around the Bend has enough room and entertaining amenities to comfortably accommodate up to 10 guests. The best part? Fido can come too because this cabin is pet friendly! Just a few miles from Pigeon Forge, this pet-friendly property features a home theater, an outdoor hot tub, and a private indoor pool! Plus, you're just minutes from the exciting attractions downtown! At Keaton’s Kottage, large groups are sure to find a variety of ways to relax and have a good time. Let your furry friends curl up on your lap in your private home theater or take a swim with the kids in your private indoor pool. 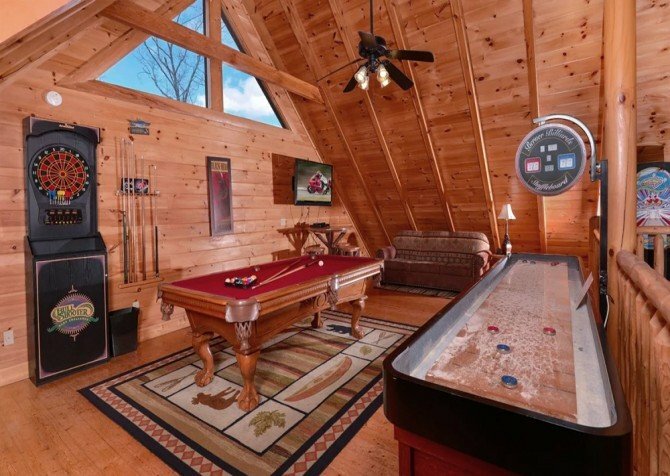 You’ll also enjoy arcade games, outdoor hot tubs, and community pool access at this upscale cabin less than 4 miles from downtown. Ready for a vacation with your best friend — aka your pup? 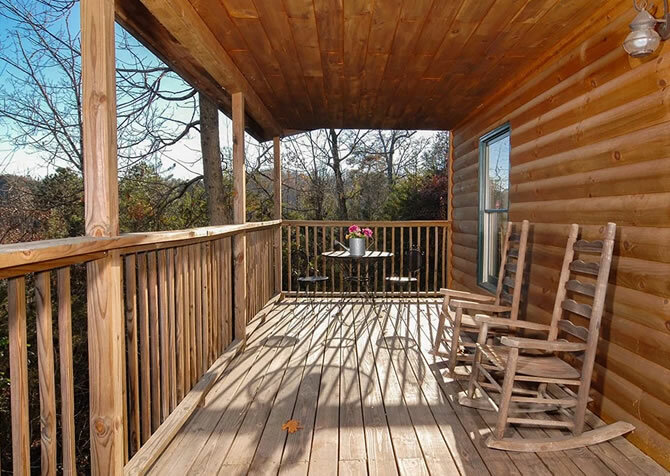 Well, look no further than Bear View, a pet-friendly, 1-bedroom cabin in Pigeon Forge. Boasting 4 flatscreen TVs, an outdoor hot tub, pool table, Xbox, and more, the smiles just won’t stop! 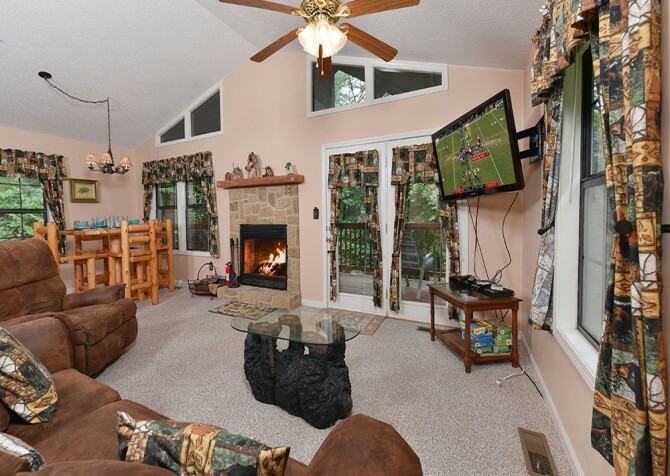 Enjoy fetch on the screened-in porch and sweet snuggles before hopping in the king-size bed. 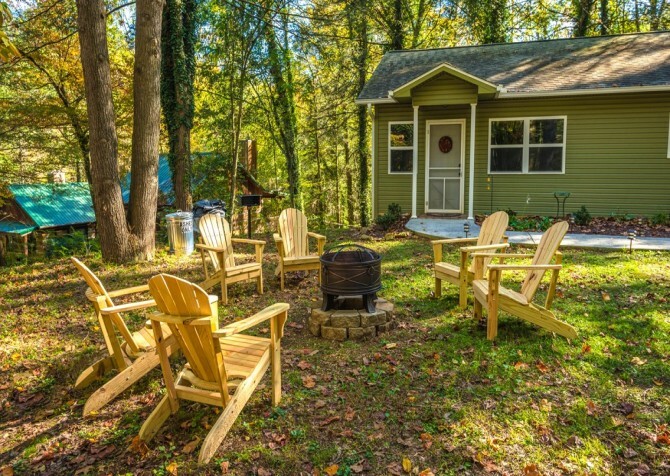 Sit by the water at this pet-friendly cabin after fun days playing in downtown Gatlinburg - just down the road. It boats a full kitchen, high-speed internet, a washer/dryer, and fun perks like a pool table, charcoal grill, and river views. Ready for a great time in the Smokies? 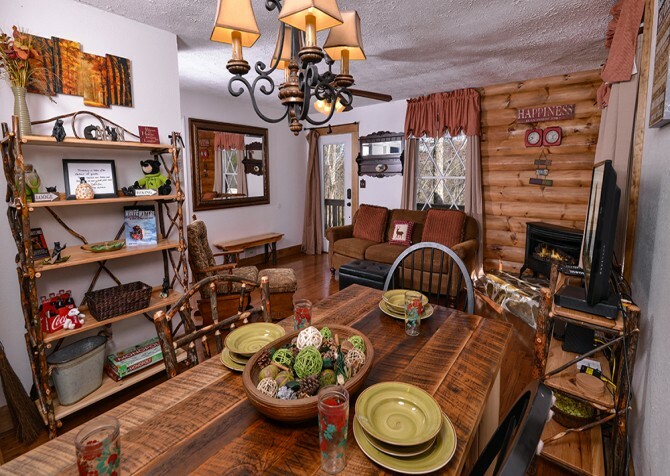 Holden On, a 3-bedroom, 2-bathroom, pet-friendly cabin in Pigeon Forge, knows just how you feel! Bust out the board games in the cabin, play foosball with the kids, bring along the family pet, and take advantage of the high-speed internet for local deals. To top it all off, there’s a hot tub and queen-size beds to keep everyone in absolute comfort.